Dedicated to Juno’s own Sarah Herrmann (pictured) and Jake Harris. Finishers. I’ve become your annoying friend who has recently discovered CrossFit and is following the Paleo diet…"OH, did I mention that I lifted a garbage truck this morning whilst eating a steak?” UM, yeah – you did. I get it – you are a CrossFitter now, so we can’t be friends. 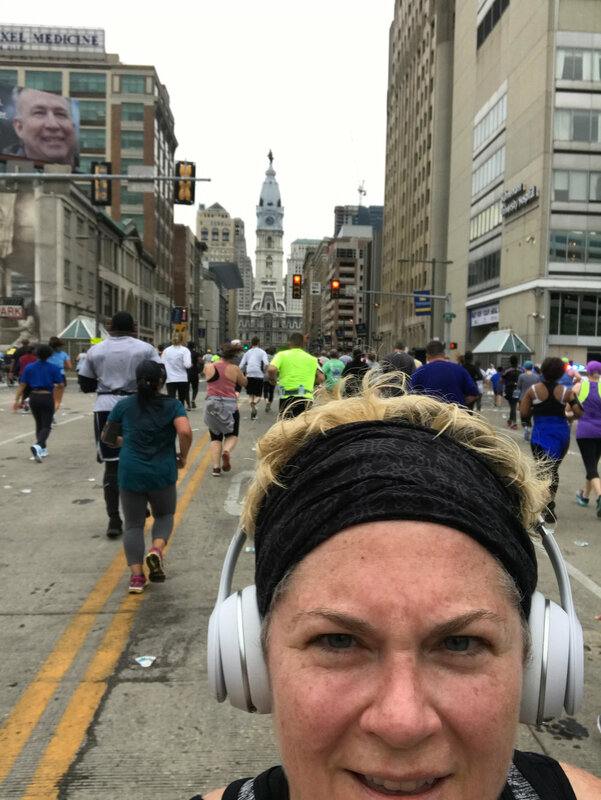 I learned a lot about myself during the training for and completion of the Broad Street Run. I also learned a lot about the influence of well-intended people, sheer determination, the power in numbers, and big goals. I’ve been thinking a ton about all of this since the race – as it pertains to our personal and professional lives. Good influencers, motivators, accountability: Who is in your corner? Who pushes you to be a better you? Who holds you accountable? A few of us from the office committed to the race and we supported and encouraged each other – gave one another the push when necessary. Sent links, sent a motivational podcast, and dragged each other out for runs. Friends travelled from Florida – one to run and one to cheer. My more experienced running friends said to me when I faced doubt, “You will absolutely complete the race. I’m proud of you. You will surprise yourself.” I was given the push when I needed it and pushed in return. I surrounded myself with the people who were going to do this with me and encouraged me. And we held each other accountable to training and to completing the race. There was actually no option – I was completing the race or suffering a heart attack. A common goal: I was in awe of what 40,000 runners looked like and felt like…the energy was incredible. A group of motivated people with one common goal in mind can accomplish a hell of a lot. You could feel the focus and determination. We were all different colors, shapes, sizes, and speeds – but there was nothing but positivity and encouragement. No judgment. No discrimination. We wanted everyone to succeed – and you could feel the energy of the other runners. In life, it can sometimes feel like some people get a bit of joy when you stumble – but there was no such feeling on race day. Some of us would be faster. Some of us would be more eloquent. Some of us would need a break. None of that mattered. Finishing is what mattered – and we were all there for each other. Who is on your sideline: Broad Street was lined with friends, family, and strangers holding signs and water cups. Bands played, people cheered. Again – the energy and good vibes of people cheering for your success is an incredible feeling. Inspiring. Motivating. Do these people show up in your life? You need people who show up for you. And you need to show up for your people. The finish line: Who is there to hug you – hold you up – be proud of what you did? Not proud, but secretly jealous. Not proud, but snarky – genuinely beaming with pride for you and what you accomplished. I don’t know – maybe this is a stretch. Maybe I’m still on some sort of runner’s high and think all of life should feel so inspiring – but I’ve gone back to this concept as it pertains to teams in business so many times now – there has to be a correlation. Is the common goal clear? Is everyone motivated to get there? Do we look past the exterior of our peers, our differences and recognize that we are one as we work towards the goal? Do we cheer for each other? Motivate each other? Encourage each other? Do we lift each other up when we fall? Celebrate at the finish line? I know often the answers to these questions are ‘no’. How do we change that narrative? How do we motivate each other? Push each other? How do we create cohesive teams that are aligned with the goal? I have some ideas – but unfortunately this piece was mostly to reiterate that I did, in fact, complete the Broad Street Run. That’s the critical message here – and if that was received, this entire blog will have served the intended purpose. Does the team understand what success looks like and will it be celebrated? Do you encourage all people equally? Does the team inspire one another? When thinking about your environment – would you describe it as positive or negative? Does the team celebrate diversity and the unique perspective that can be born from being diverse? Do you have motivated people who are committed to the goal? One last thing: Ten miles. Ten.